This is our old website, left here for posterity, do hunt around to find out about our club between 2006 and 2018. Between them, they play music from Galicia, Ireland, Scotland, England, France, Brittany, Sweden and Finland, along with an eclectic mixture of songs. What is Folk Music? 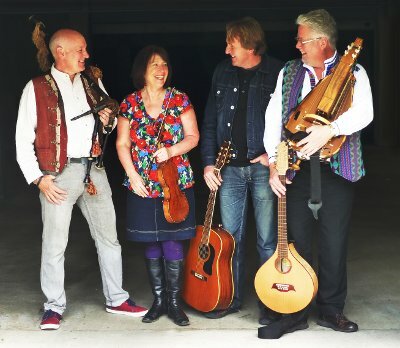 – You'll be amazed at what is covered by the heading Folk Music: from traditional finger in the ear to modern acoustic, soft lilting ballads to modern Folk Rock, the field is huge and there is a little bit in there for everyone. We're a totally informal, small friendly group of people who like to sing and play music. If you do not sing or play and would like to then here you'll find encouragement. There is never any pressure and you may wish to visit a few times to get confidence or you may already be confident, it does not matter, no one will criticize, only support. The Club was conceived in 1965 when the Clancy Brothers didn't come and someone had the astounding idea of having a sing-a-round thus transforming an audience into a folk group. Formally established in 1966 we're still going strong.